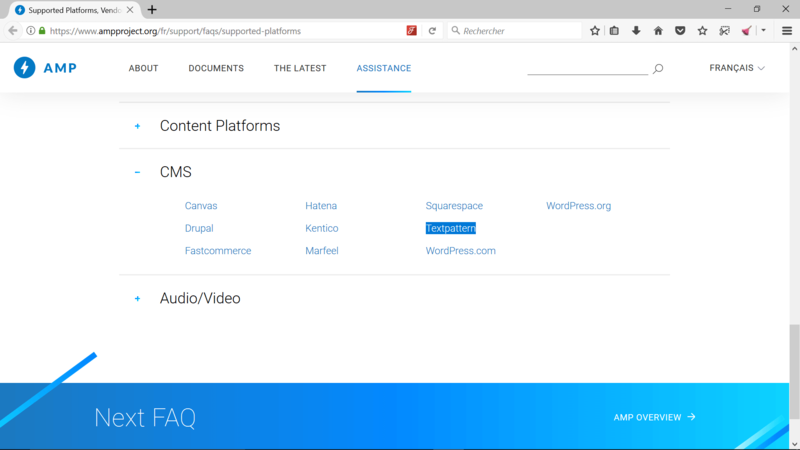 After my demand to the Google’s AMP team and a long time to wait (3 months), Textpattern CMS will be referenced soon within the official AMP project under the “Supported Platforms, Vendors and Partners” page, “CMS” section (https://www.ampproject.org/support/faqs/supported-platforms). Thank Phil for his blog page as an example without which Textpattern CMS would not have been referenced. Done! Just before WordPress (listed twice). Nice. I’ll keep an eye on the Analytics and see if we get an up-tiick. Thanks Patrick!